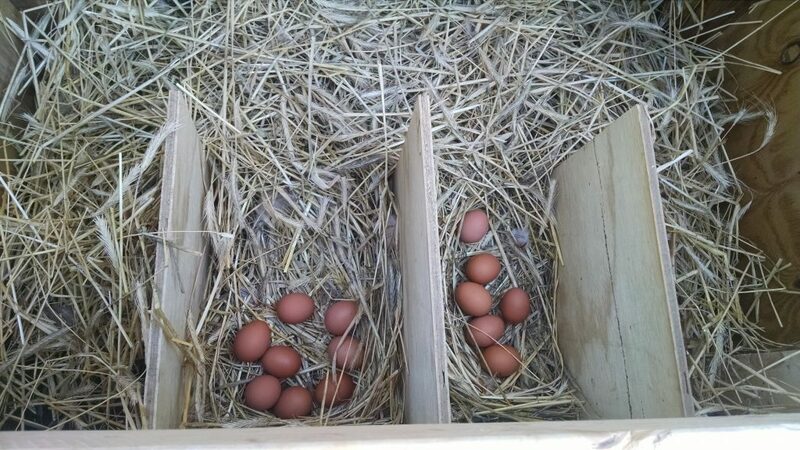 When our oldest, who lives nearby, said she was going to get chickens earlier this year, I couldn’t have been happier. Having had chickens years ago, I knew she would love having fresh eggs and would need a network of people (including me!) to take them off her hands. When their family took off for a few days away, I was delighted to volunteer to take care of the chickens. The chickens roam their property all day long and just go into the chicken coop and pen at night. 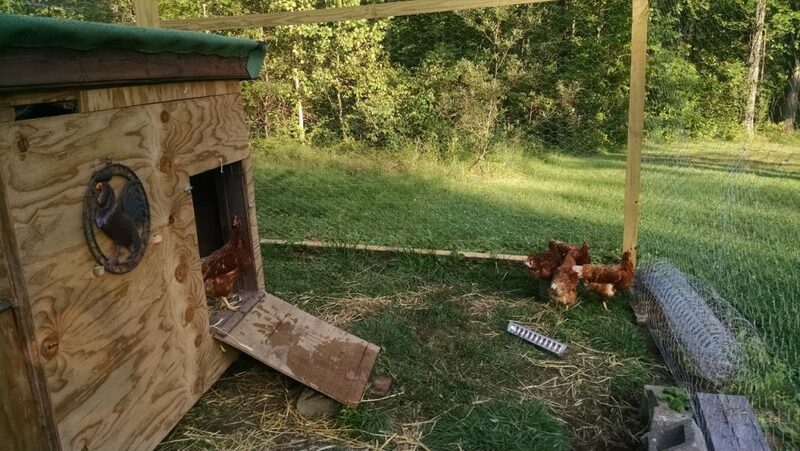 Pretty swanky digs for chickens, right? The eggs are absolutely delicious. Two days worth of eggs from six chickens. The chickens are laying eggs like crazy. Shannon called me just the other day to tell me she collected 16 eggs and that I better come over and get some. Now that’s a good problem to have! Too many eggs! Therefore I’ve been cooking with eggs more than I usually do. 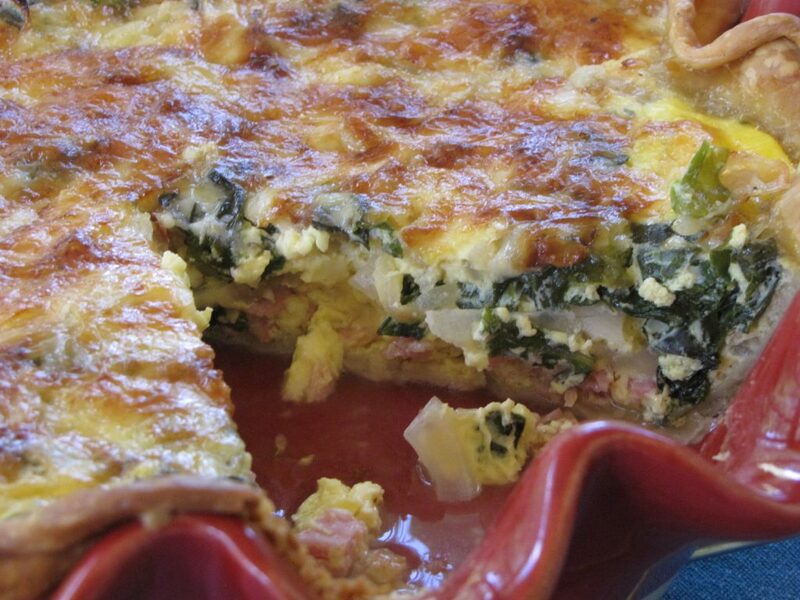 This recipe for Ham, Cheddar & Swiss Chard Quiche was inspired by an abundance of fresh eggs, Cabot cheese, deli ham and a handful of swiss chard picked from the garden. I also happened to have a ready-made pie crust on hand. Definitely made making a quiche a no-brainer. Preheat your oven to 350F. In the meantime, saute half an onion with about a cup and a half of chopped swiss chard (or spinach) in a skillet until the onions are soft. Saute onions and greens until the onions are soft. Next grab a few slices of deli ham and chop them up. 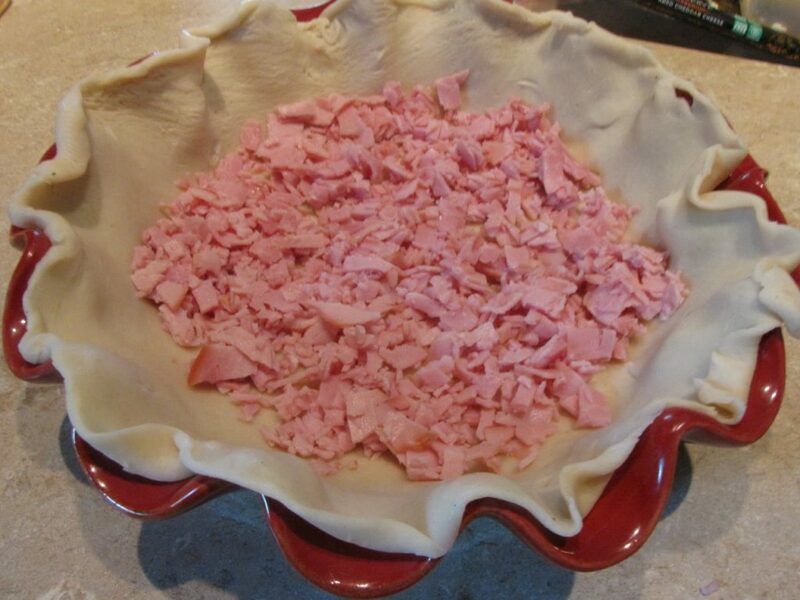 Place a 9″ pie crust in a pie plate and add the ham on top. Next up – cheese!!!! I love cheese and tend to use what I have on hand when I make quiche. This time I used two of my favorite cheddar cheeses – Cabot Farmhouse Reserve and Cabot New York Vintage. I used equal parts of each, for a total of 1 1/2 cups. Divide in two. Layer half of the cheese on top of the ham. Then add the onions and chard mixture. Top with the remaining cheese. 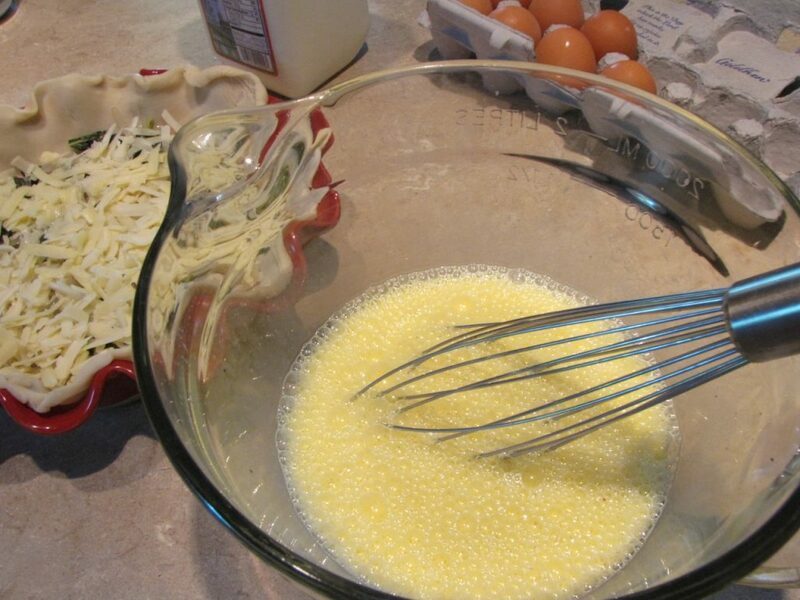 Mix four eggs, 1 1/2 cups milk and a little pepper. Pour over the egg, ham, veggie and cheese layers. Bake for about 40 minutes – until a knife inserted in the center comes out clean. 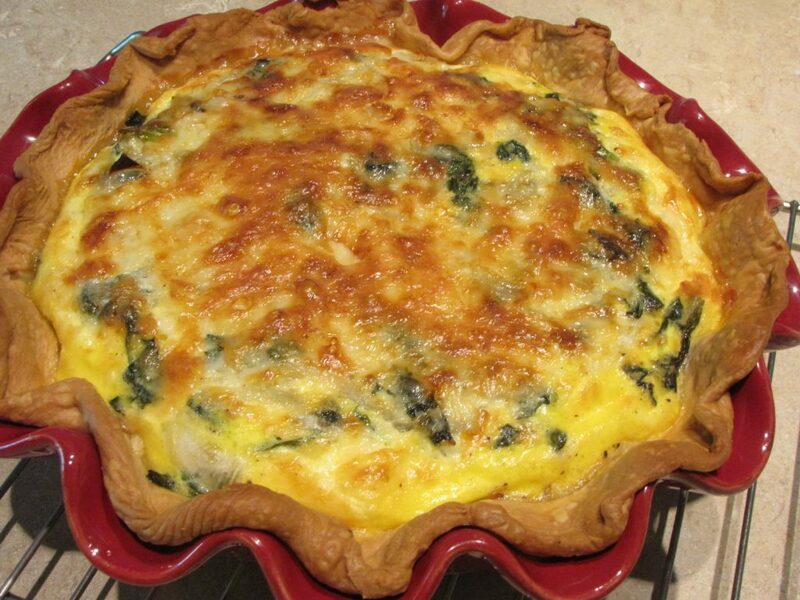 Allow the quiche to set for at least 10 minutes so that it has a firmer texture when you cut out that first slice. This quiche is great – warm, at room temperature or cold. Here’s the recipe in a format that you can easily print out and give a try. Let me know what you think, any changes you made or your favorite quiche combo. 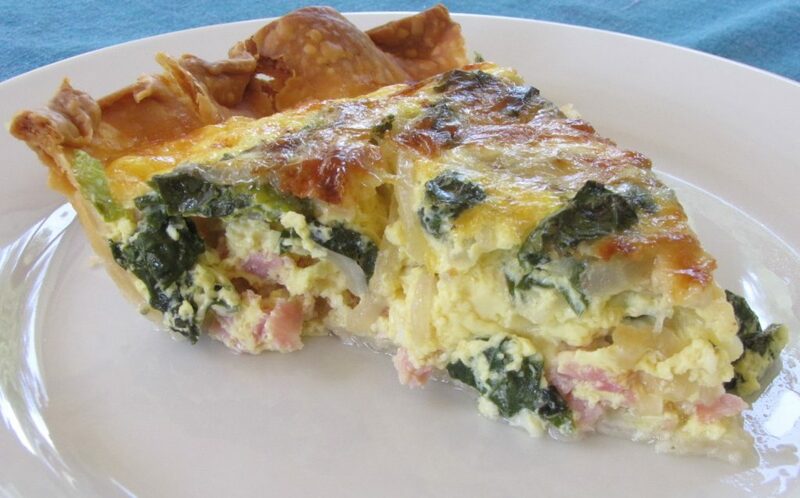 An abundance of fresh eggs and a love of cheddar cheese inspired this quick and easy recipe for ham, cheddar & swiss chard quiche. Great warm, served at room temperature or cold. Place 9" pie crust in a pie plate. 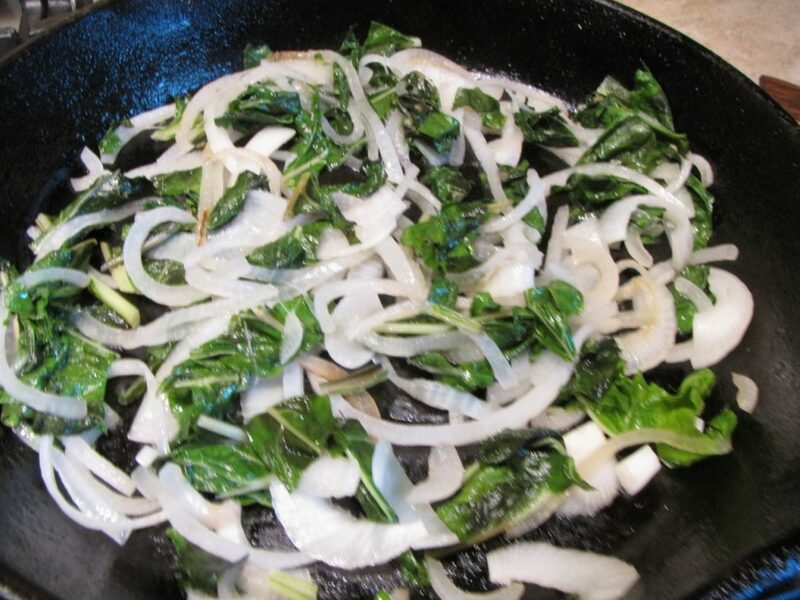 Saute onions and swiss chard in a skillet with a little oil until the onions are soft. 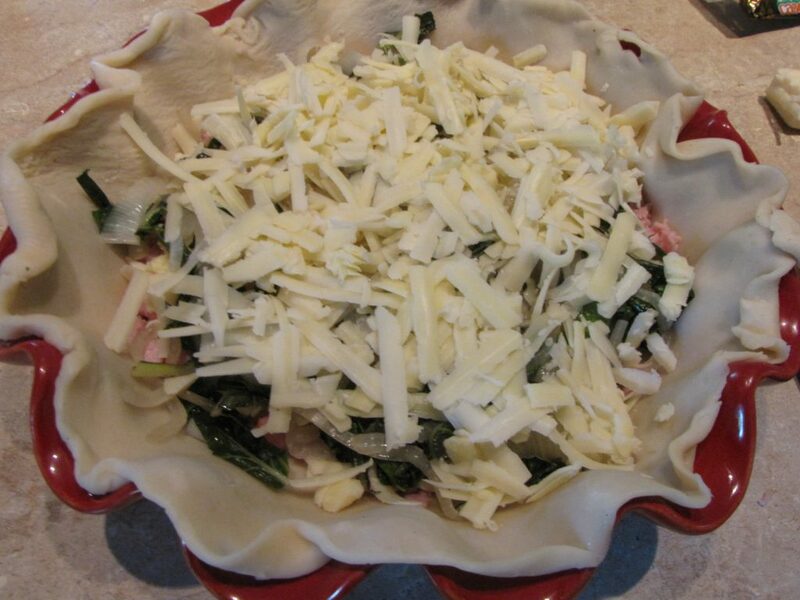 In the pie crust, layer the ham, half the cheese, the onion/chard mixture, and top with the remaining ham. Pour over the layered ingredients in the pie crust. 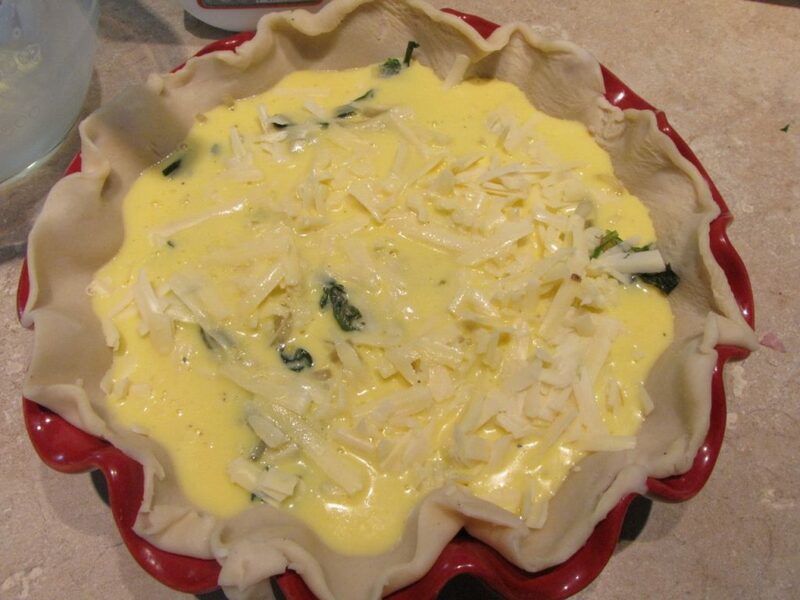 Bake for 40 minutes or until a knife inserted in the center of the quiche comes out clean. Cool grabbing your own eggs. I really like all the ingredients in your quiche. I am jealous not only of your quiche but that you can get farm fresh eggs. How awesome! !